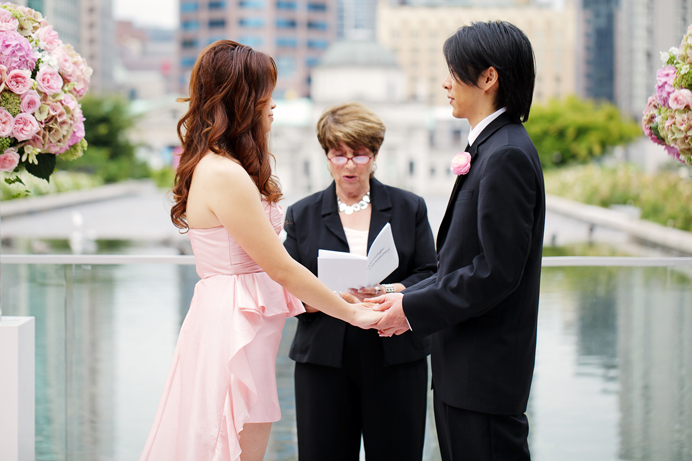 Lily and Leon are a Washington State couple planning a wedding in Maui, but they also wanted to have a wedding ceremony in Lily’s hometown of Vancouver, BC. 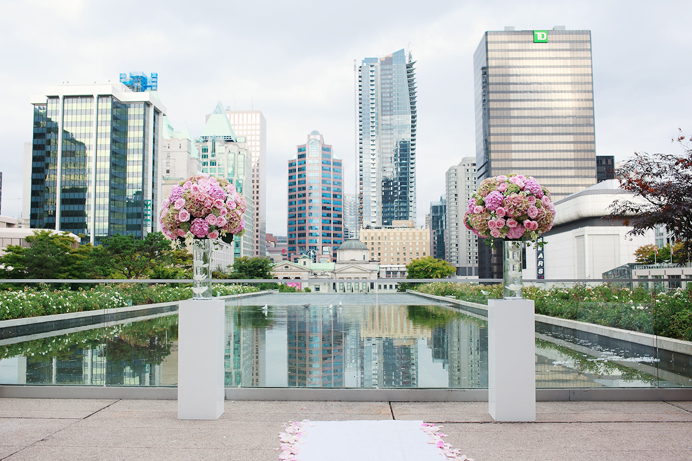 So they planned for a wedding at the Law Courts Inn in downtown Vancouver and designed it with a very unique twist. They planned a small and intimate wedding ceremony with only a few guests and Lily put in a ton of work to design the ultimate pink wedding. I knew how beautiful this was going to be when I first met with Lily and she pulled out her iPad inspiration board to show me their “pink” vision for the wedding. 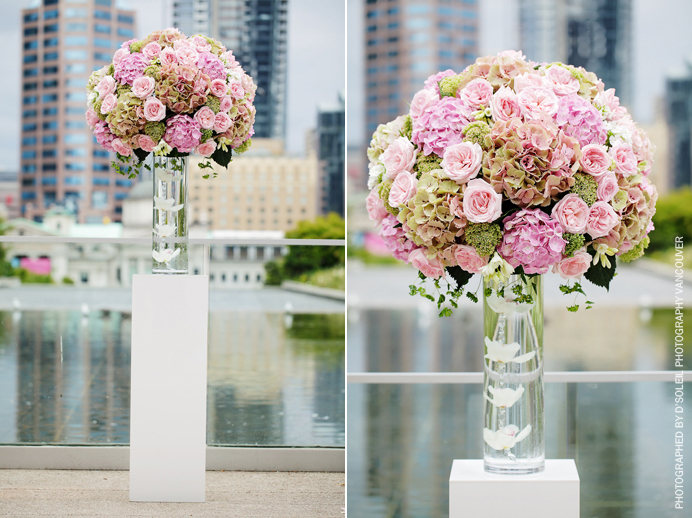 It was creative, vibrant, splendid, and of course, all pink! She later admitted that her design was so opposite her personality. She describes herself as somewhat of a “tom-boy”, so she wanted a wedding that would look somewhat unexpected…and boy did she pull it off. Her design did not disappoint! 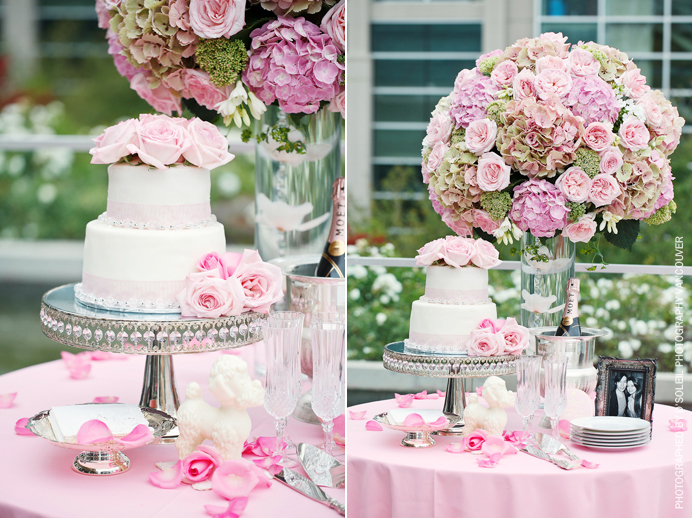 She made the cake herself as well as the “broach” bouquet (yes – hand-made completely out of broaches). 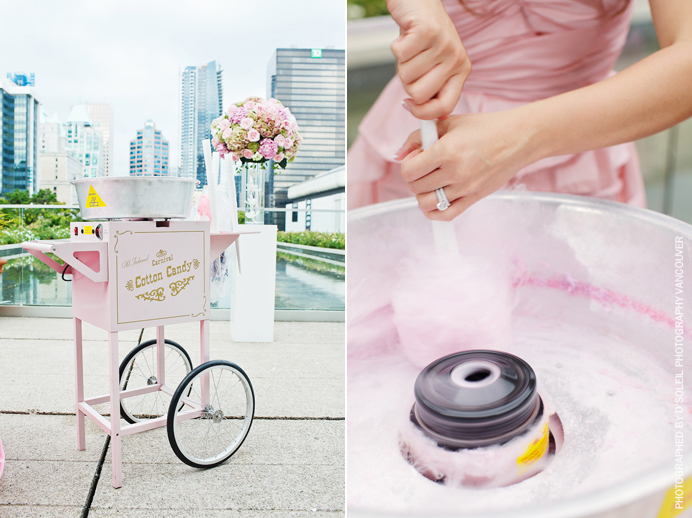 They brought in stylish ghost chairs, a pink table cloth, flowers by Garden Party Flowers, a white chocolate poodle, and pink (rose) Moet Champagne, other modern vintage and touches of bling, and of course a pink cotton candy machine from Frankie’s Candy Bar. Bailey was on hand to help with the day of coordination and to help with setting up Lily’s amazing wedding design work – Can’t believe she did it all herself. Lily is such an amazing talent. 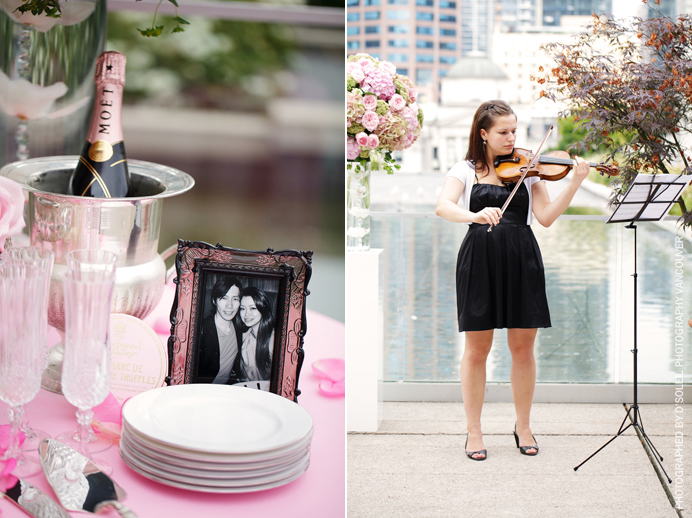 Above are just a few previews from their pink Vancouver wedding! LOVE all the pink! 🙂 I used to have a Barbie that had a similar dress! Love it! I love it! 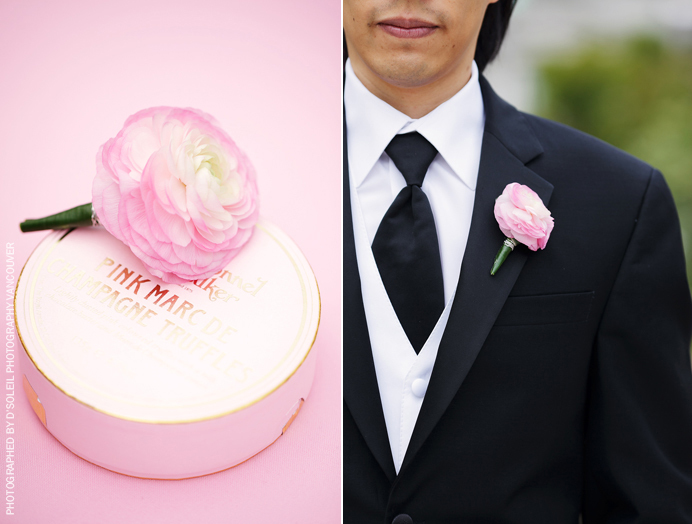 Pink is 100% not my colour at all, but this is so striking, sophisticated and lovely! Absolutely stunning. Wow! Amazing! 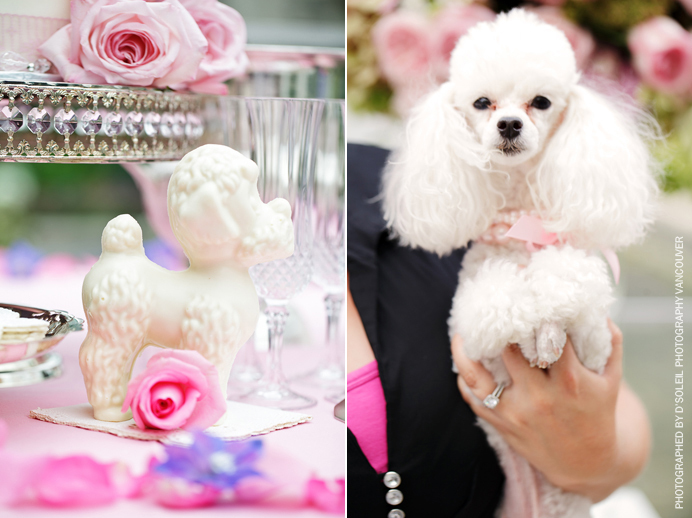 I love her dress and all the pink details – and especially the little poodle! 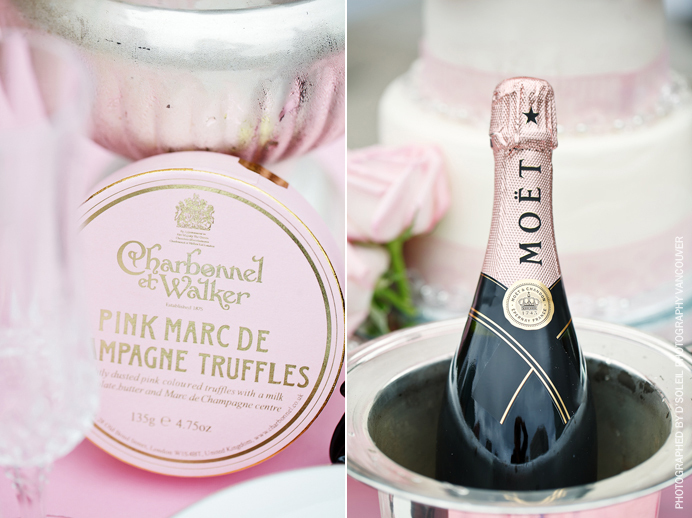 Pink perfection! This wedding is so absolutely perfect. The poodle was just the cherry on top. LOVE! I love the pink dress. You rarely see wedding dresses that are not white in England. Nice work. Wow. The details are incredible. Beautiful photos too! Like her pink original dress!It is great! 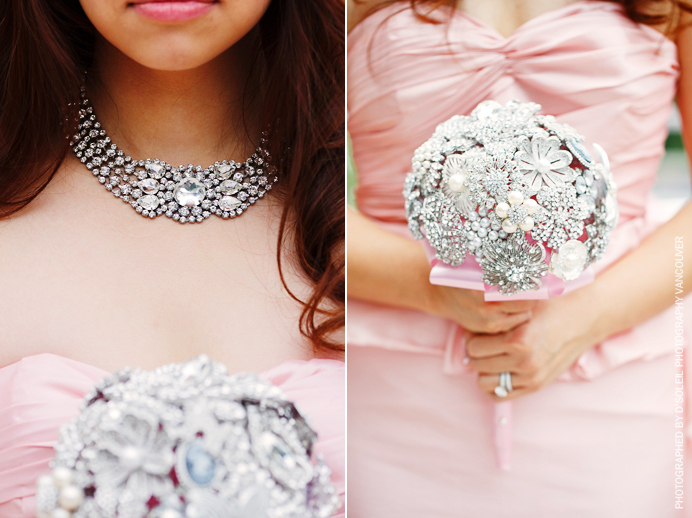 She had a wonderful motif color – pink! It’s very feminine though she said she is somewhat “tom-boy”.